Our classic teakettle rocketed to popularity when introduced over 30 years ago. The accolades continue for this timeless Chantal original, sure to remain a design icon and home favorite for the foreseeable future. The immediately recognizable shape and characteristic stainless steel handle say it’s Chantal, and our copper version is truly breathtaking. 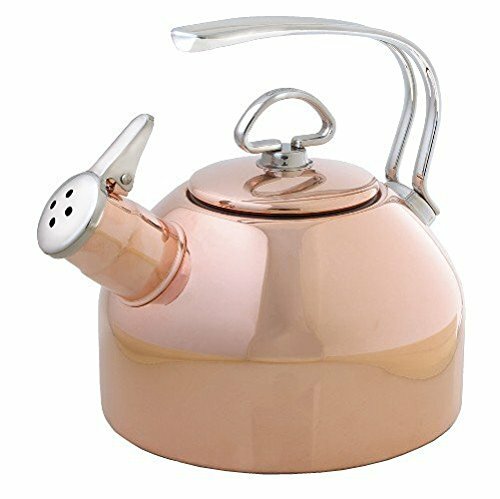 Unlike many other copper kettles currently available in the market, our copper kettle will not need to have any lacquer removed before its first use. Featuring our exclusive two-tone Hohner Harmonica whistle, this kettle doesn’t just whistle – it sings! Like all our standard-size kettles, our copper classic teakettle boasts a functional capacity of 1.8 quarts. Chantal copper teakettles are perfect for all stove tops, Including magnetic induction. Limited warranty.